Neutelings Riedijk Architects has won the international design contest for the new Kolizej Center in Ljubljana (Slovenia). The project contains a music theater including 1400 seats, 25.000 m2 offices, 100 apartments, a shopping arcade and an underground parking lot. The building costs are estimated 150 million euros. The design exists of a compact municipal block with a shopping arcade and the music theater. The main block is a conical design and separates into three office building blocks, including a large 25 storey tower, which will be the highest point in Ljubljana. 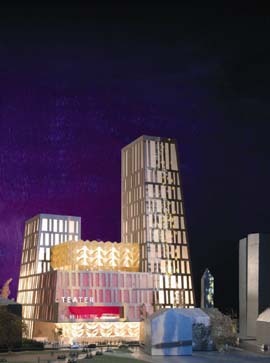 An international jury headed by professor Boris Podrecca chose the design. Other offices participating to the contest were Rafael Moneo (Madrid), David Chipperfield en FOA Architects (London), Bolles-Wilson (Munster) and Haikonen-Komonen (Helsinki). 30 November 2004. Matevz Celik from TrajekT wrote an update about the Kolizej centre in Ljubljana (Slovenia) by Neutelings Riedijk.